These are the transcripts of an interview with Lupe Fiasco on DJ Hyphen & J. Moore's "Sunday Night Sound Session" on Seattle's KUBE 93.3 FM. For more info. on DJ Hyphen click here. MVRemix: We were just talking off the air, you've been to Seattle once before or multiple times before? 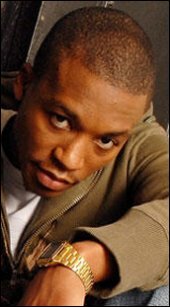 Lupe Fiasco: Once before, I came out here with the Ye-germeister (Kanye West) for his "Touch The Sky" tour out in Everett. So we did a show out there. It's my second time in Seattle. MVRemix: You like it so far? Or do you like the city, what you've seen of it in your limited time here? Lupe Fiasco: Yeah, it was dope. My homie Cash caught up, was droving me around. I went to get some food, and we went to the hood - to different spots. The first time I was downtown, but we went to other parts of Seattle. It was dope to see the city, it's a nice little city. Lupe Fiasco: Yeah! Every time I come it's sunny days. As soon as I leave, it be like terrential downpours. Lupe Fiasco: Yeah, its been pushed back to September actually. September 19th, and it's mainly because of the record company. It's not because of the bootlegging, it's not because of the presence in the media, it's not 'cause of anything like that. It's just the protocol that the record company has taken - it's too slow to release. Like we wanted to release August 27th, but they not even doing what they 'posed to do in certain arenas. It's technical, it's nothin' to do with the quality of the music or nothin' like that. They're just taking stutter steppin' to get stuff out. It's a label deal, like I've got a company called 1st and 15th - so it's 1st and 15th and Atlantic. So you've got two entities trying to reach the same goal, we just do it in different ways. So when Atlantic's agenda ain't really meetin' up with ours, we pull it back. Like we pulled it back, 1st and 15th pulled it back because the label wasn't on point. MVRemix: Speaking of the album, the buzz of the album has been real, real crazy. Especially as a lot of cuts got leaked on the internet, so they created a frenzy. What are your particular feelings on leaks or bootlegging? Lupe Fiasco: Initially it was a shock. It was bittersweet, especially on that day. 'Cause "Kick Push" debuted on TRL, I was in the studio with Jill Scott, we was in Philly and I drive back to New York and it was like, "Yo, your album got leaked." "Ah, okay, you've got to be kiddin'." "Nah, it leaked... dah dah dah dah..." It feels like a painting in a park. He was painting a picture, he was painting this mountain and he's not done. He's got the trace lines and maybe a few colours, he got a sheet on it and he goes to get a sandwich. He comes back and somebody took the sheet off and wrote they name on it. They finished it and turned it into not even a mountain, it's like a Ferrari now, with they name on it. So it's kind of like that creatively to just lose how you wanted the album to be presented - from the song titles being wrong to when we did the show, the kids being like, "Do such and such!" I'm like, "What is that?" "No Place To Go!" "That's not what it's called man..."
MVRemix: [Joe] Budden was talking about that too, Budden said he's got that track that was labelled "Def Jam Diss" by the bootleggers, he was like "That didn't help my whole situation." MVRemix: I was going to ask you in a backwards way; what have been the advantages to it? Lupe Fiasco: The advantages have been, for one, it has relieved the pressure over me as far as making a classic album or what appears to be a classic album, 'cause the instant that it dropped all the reviews that it got. From the kids on the forum, like 70% was like, "Yo, this is a monster." That's what I want it to do, I didn't really come out to sell records. If it sell records, that's a bi-product. For me, I wanted to first set out an album, so I could set up a career hopefully to sell records later on, and to know we achieved that early was dope. I was like, "Yeah, that's fresh." One benefit now is I can - it's a double edged sword, 'cause now when I do shows people expect me to do two hours. They expect me to do two hours like "We heard all the music! We know every word..." So I'll do a show now, do a song now and the kids will know every word. You're like, "Wow, they know every word." MVRemix: The mixtape stuff too. Lupe Fiasco: The mixtape stuff, the bootleg album stuff. Everything in between. It's like kids know every word. It's dope to kind of know you've got that presence and awareness with your fans, with the people. Without no video, nothin' like that. That's a beautiful thing. Lupe Fiasco: Mine is very blatant, my screen name is real blatant. I'll go on there and just post tracks for them like secret little stuff that I'm workin' on and get they feedback. MVRemix: Do you like doing that or is it more like market research in kind of a weird way? Lupe Fiasco: Nah, I like it because I'm a nerd man. I like the internet. Some people are like, "Man, the internet is wack!" No it's not, internet's fun. I like doing that, especially in that arena. It's some kids who know Hip Hop, different from Myspace where it's just like fans and stuff whereas on here [Okayplayer] they really rock with you. It's dope. It's dope market research too; see what's poppin' off in the streets. "It was just like how you lose that creative control and how you want it to be presented to your fans. But it was dope, at the end of the day I can't be mad - it was probably the best thing to happen to the album."